deficiency has become a pandemic with about 1 billion people all over the world having low levels of vitamin D. Although adequate levels of vitamin D can be produced by the body with regular exposure to sunlight, vitamin D insufficiency prevails in India due to several other factors like dietary habits, increasing pollution and genetics. The fact that vitamin D alone can influence about 3000 genes of our body (out of the total 24000 genes) clearly signifies its importance in our system. Extensive studies have explored the role of vitamin D in health problems. 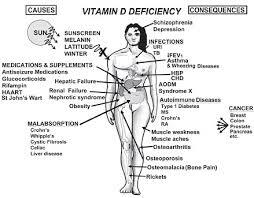 Vitamin D deficiency has been linked to over a hundred health issues till now. Here are top 12 health risks you might be facing due to low levels of vitamin D.